Children are VIPs at Wood Library: Very Important Patrons. Our children’s area is a warm and inviting place for children and families to explore, play, and enjoy. Collections include books for babies through 5th graders, book-and-toy sets, children’s music, dvd’s and books on cd. Visit our Play Space with toys and activity centers to encourage a child’s creativity. 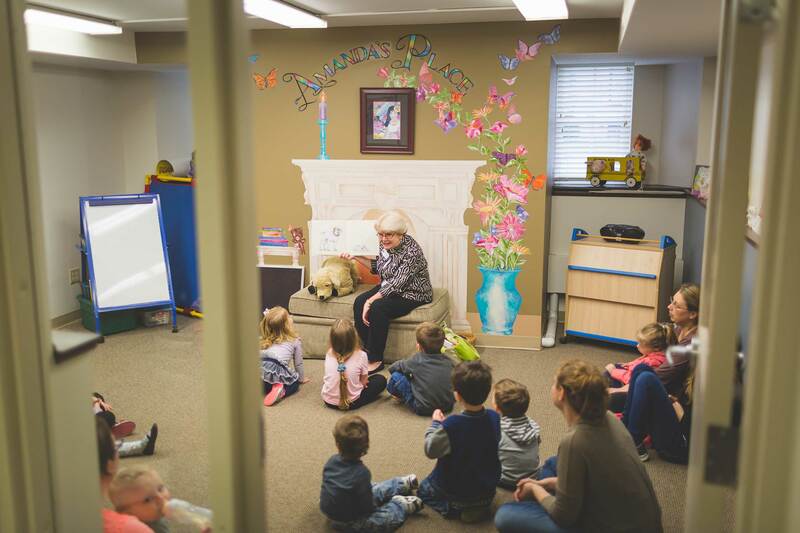 The Story Room is a perfect cozy setting for our story programs. A wide variety of programs for children of all ages are offered. 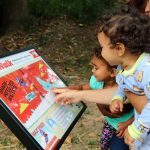 Come to the park and enjoy our permanent StoryWalk. Each month we will feature a different picture book for families to enjoy. Read the book as you take a walk along the trail. Our book for April will be “The Listening Walk” by Paul Showers. This story will be up through the month. Click here for a map to get to the park! Two year olds and their parents can enjoy simple stories, songs, and fingerplays in this 20 minute program. This weekly series is offered on Monday and Tuesday mornings in the winter, spring and fall. Registration is required. Click here and go to our calendar to register for the current session. A 30 minute early literacy program of stories, songs, puppets, finger plays, and the flannelboard especially for 3, 4, and 5 year olds. This weekly series is scheduled for Wednesday and Thursday mornings and is offered in the winter, spring, summer, and fall. Registration is requested. To sign up, click here for the online calendar, visit the library or call 585-394-1381. A 20 minute language enrichment program for 6 – 24 month olds featuring nursery rhymes, songs, a story and activities. The program is generally held the first Friday of each month with a class for Walkers and another for Pre-Walkers with play time after each class. Please register online, at the library or by calling 585-394-1381. The concept is simple, the rewards are priceless. Read a book (any book) to your newborn, infant, and/or toddler. The goal is to have read 1,000 books (yes you can repeat books) before your child starts kindergarten. 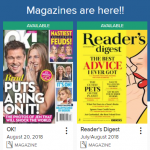 Click here to download the registration form or sign up at the library to get your packet and first reading log. Then just start enjoying books together! Children 3 – 7 years old can wear their jammies and come to the library for stories, songs, a short movie and fun; parents are invited to join their children. This is a drop-in evening program offered during the summer, as well as during National Library Week and before Christmas. The slogan will be A Universe of Stories. 2019 is the 50th anniversary of the Apollo Moon Landing. Wood Library will offer 3 clubs for children to keep them reading and enjoying books during the summer months. There will be a Read-to-Me club for preschoolers plus 2 separate clubs for school age children: one for children going into grades 1-3 to help them maintain their reading skills during their vacation months by keeping track of the number of books they read or listen to and one for 4th – 6th graders to help them discover new genres and explore the fun they can have through books by tracking the number of minutes they read. The preschool artists from the VA Montessori School whose artwork been on display for the past month will hear a story and be recognized at a family reception in the Children’s Room sponsored by the Friends of Wood Library. It’s time to do some building! We have the Legos, so just bring your imagination! This program is for kids in grades K-5. When you’re done creating, display your model in the Children’s Room. Sign-up so you won’t get left out! Registration requested. Registration begins April 1. If you have some old paperbacks that you’ve read and enjoyed, but don’t want to keep, clean off your shelves and bring your books to the library to trade them one-for-one at our Paperback Swap. Leave your money at home because it’s all free! 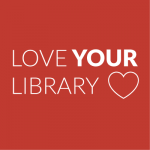 Celebrate National Library Week (which was last week) and Spring Break at our special PJ storytime. Stories, fingerplays, and a short movie for 3–7 year olds. Parents are invited to enjoy the program with their children. No registration is necessary. Bring your lunch to munch on while you watch a fun family movie! The Lorax is a lovable creature who speaks for the trees, trying to stop Once-ler from destroying the forest. Bring your favorite stuffed animal, doll, or puppet to a special story program in our Ewing Room. After stories and snacks, we’ll go to the Story Room to tuck the toys in for the night – THEY get to sleep at the library! Come back on Saturday morning from 10-12 to pick them up and watch the slideshow of what they did overnight. Registration requested. It’s Earth Day so we’re celebrating with the Lorax! Long before saving the earth became a global concern, Dr. Seuss, speaking through his character the Lorax, warned against mindless progress and the danger it posed to the earth’s natural beauty. We’ll read the story and have crafts, snacks and games based on this classic story. Registration is requested. Please register online, at the library or by calling 585-394-1381. Crafty after school fun for grades K-5. Create an image using your fingerprint and attach it to a glass pebble! Registration is requested. A snack will be provided. Sign up at the library, by calling 585-394-1381, or by using the online calendar. Come and play with your child at our sensory stations! Sensory play is any activity that stimulates a child’s senses: touch, smell, taste, sight and hearing. Though sensory play, children explore and naturally use scientific processes while they play, investigate, create and discover new sensations. This program will incorporate the early literacy skill of play into a variety of sensory experiences. There will be several stations to explore. Caregivers are expected to interact with their child at each station. Drop-in program. If your preschooler loves to dance, don’t miss our Dance Party! We’ll begin with a short story and then start hopping and bopping to music using bells, shakers, scarves, bubbles and our parachute to enhance the fun. There is no sign-up for this 45-minute program. Just come and be ready to move! Note: this program is usually on the last Saturday of the month, but check out calendar to be sure of the date for each month. Come celebrate that special person you call Mommy! Children ages 3-5 are invited to dress up and bring that special lady or ladies in their life – Mommy, Grandma, etc. for our afternoon tea. Refreshments and stories will be served. Reservations are required. Registration is required. Please register online, at the library or by calling 585-394-1381. 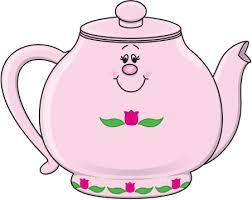 We’ll read the fun stories and have crafts, snacks and games based on the books by Doreen Cronin. Registration is requested. Please register online, at the library or by calling 585-394-1381. Crafty after school fun for grades K-5. Make a slap band using duck tape and a tape measure! Registration is requested. A snack will be provided. Sign up at the library, by calling 585-394-1381, or by using the online calendar. Click here for a printable copy of our summer flyer!